You might be able to spot lots of people sporting daffodil pins this month. Fundraising Specialist Michelle McIntyre says the Canadian Cancer Society's Daffodil Month campaign shines a light on the disease. "The Canadian Cancer Society itself focuses on research, but we're also focusing on prevention too. We want to bring awareness to different ways that you can change your lifestyle and ways you can improve it to prevent cancer from affecting you." 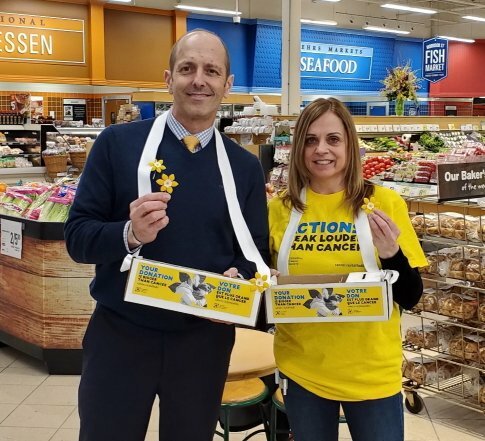 Volunteers will be selling the daffodil pins at grocery stores across the Niagara Region this month. They'll also be going door-to-door in local communities. You can also create a digital daffodil online here, and share it to your social media pages. McIntyre sale the money raised through their daffodil pin sales will benefit great programs like Wheels of Hope. "They're volunteer drivers who bring patients to services like the Juravinski Cancer Centre and other locations, sometimes even having to go as far as Toronto for the Princess Margaret Cancer Centre for treatment and it offers them those services." The Niagara campaign is hoping to bring in $100,000.